"Though Rich has a glorious record as an exhibitor, with the 1997 Champion of Champions to his credit, and International Large Golds, he has not forgotten what it is like to be struggling with that first exhibit..."
"I have spent more time at exhibit frames with Rich than any other judge, perhaps more than most other judges combined. Rich has spent extended time with me at the frames at shows in which he was not even on the jury. He has invited me to his home to go over exhibits in depth, one-on-one. From conversations with other exhibitors, I believe his individual counseling with me is far from unique." "Rich has the exceptional ability to provide feedback in a very positive manner, even when the exhibit has major problems, without making the exhibitor feel embarrassed. After getting feedback exhibitors cannot wait to get back in the frames after applying Rich�s suggestions." Though Rich has a glorious record as an exhibitor, with the 1997 Champion of Champions to his credit, and International Large Golds, he has not forgotten what it is like to be struggling with that fi rst exhibit, and is both sympathetic and helpful in providing guidance that helps exhibitors move up to the next level. He was accredited as an APS philatelic judge in 1984, and has subsequently been accredited as a literature judge, as a chief judge in both disciplines, and at the FIP level as an international judge. 30 years after his initial accreditation, he remains very much in demand as a working judge and jury chairman. Among his most recent contributions, he has been leading the effort to revise and expand the criteria for literature judging so as to bring this segment of philatelic exhibiting into the electronic age. He is a most worthy recipient, and we believe that his long-time friend Bud Hennig would be both proud and pleased to see him recognized for his accomplishments. 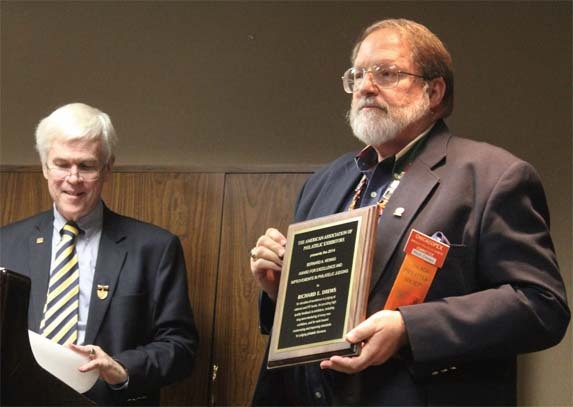 Nominations Welcome for the 2015 Hennig Award Nominations are open for a currently active judge who has demonstrated consistent excellence as a philatelic and/or literature judge, over a prolonged period, at the national level. A nomination form is quick to fill out.